El Mercadito, located on the first level on the right-hand side of Plaza Adelante, serves as an incubator for microbusinesses started by MEDA clients. 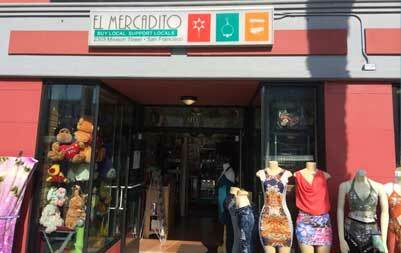 There are currently six small businesses in the Mission District El Mercadito, plus a cozy Peruvian food shop in Plaza Adelante’s paseo. There is even a new Tenderloin El Mercadito, which currently features a café. All business owners went through MEDA’s free Business Development Program and later received one-on-one coaching. I am originally from El Salvador, coming to the United States in 1990. I always wanted to have a business from the time I lived in that country. I had a car dealership in Monterey County before, so the idea to start a business again was always in my mind. How did you learn about MEDA’s Business Development Program? I was going to have lunch in the Mission and happened to walk by Plaza Adelante one day and saw El Mercadito. I spoke with one of the shopkeepers there and, when she saw my enthusiasm for starting a small business, she advised me to go upstairs to talk about the free Business Development workshops offered at MEDA. I took that six-session workshop and later received one-on-one coaching. I did not experience difficulties in starting a business. The administration is the toughest part for me. That is why my current Business Coach Alexander Ankrom is assisting me on items such as budgeting. He has set me up with a QuickBooks Point-of-Sale system, which he is teaching me to maximize. Alexander and I are also working toward a one-year plan for the business. I am selling clothing, which all sells pretty well. I do switch out my inventory to reflect the seasons. Beside the administration side, as previously stated, it would be marketing. MEDA has a great social media volunteer who has recently helped me set up my business Facebook page. They also got me on Trip Advisor. I’d like to be in a bigger location, still selling clothing, but with an even greater selection. I also want to have some employees. Right now, my daughter, Kayla, helps me out at times, but otherwise it is just me. I am glad for the time that MEDA has let me have my business in El Mercadito, their Mission microbusiness incubator.